A street collection by members of the Rotary Club of Cranleigh on Saturday, 23 May raised £536 for the Rotary Emergency Fund in support of earthquake victims in Nepal. This money will be mainly be used to provide shelter and clean water in the coming months through Rotary contacts in Nepal. “Once again, the people of Cranleigh and the neighbouring villages have shown their generosity in support of people who are in dire straits on the other side of the world,” said Cranleigh Rotarian David Reed, chairman of the club’s international committee. 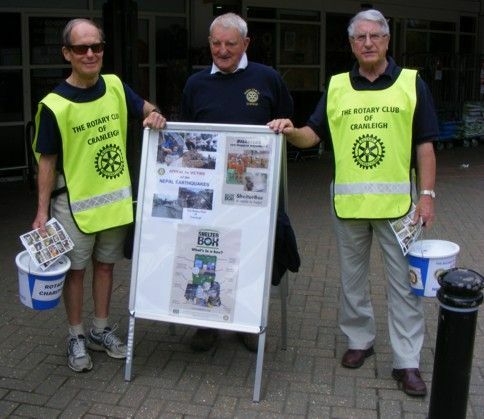 Caption: John Menlove, President of the Rotary Club of Cranleigh (centre), accompanied by Brian Vine (left) and Norman Every.